OS-College teaches about cross-platform software than runs equally on Windows, Mac, Linux, and other desktop operating systems. Currently, the articles and videos on this Website are about LibreOffice, an open-source suite that works equally well on Windows, Mac, and Linux distros. In Calc, you can easily click a cell to add or delete a single row or column. However, the spreadsheet application does not offer as straight forward of a method for adding multiple rows and columns or deleting them. To add columns and rows, you need to highlight cells in the same number of rows that you want to add. If you want to delete rows and columns that are not next to each other, you need to hold down a key while using your mouse. The below video demonstrates this. The following page contains the video and is a tutorial on inserting and deleting rows and columns. LibreOffice Calc: Inserting and deleting multiple rows and columns from OS-College on Vimeo. Software wizards make the tasks easier for users. 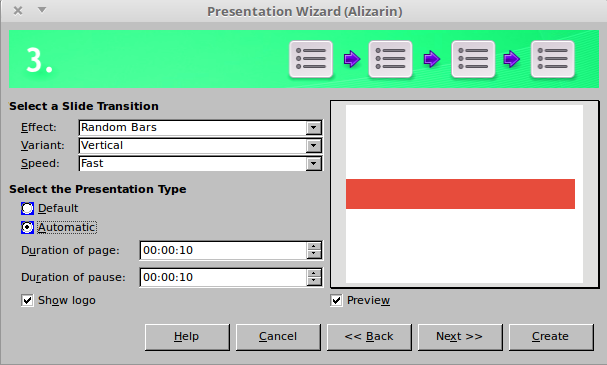 LibreOffice’s Presentation wizard has helped users set up documents in Impress by allowing them to apply templates and control how those presentations were played. The wizard is available in versions 5.2 and older. Starting with version 5.3, The Document Foundation has abandoned the wizard. They instead improved the Template Manager, and that is used to set up new presentations. However, many Linux distributions come with older versions of LibreOffice with the installations, so this page covers the old wizard. The Presentation Wizard can be accessed from the Wizard sub-menu in the File menu in StartCenter and any one of the six applications, so it can be launched from Writer, Calc, Draw, Base, and Math, as well as Impress.